Kim Kardashian Stuns Alongside Kanye West at 2016 Met Gala—and North West Wants Her Dress! 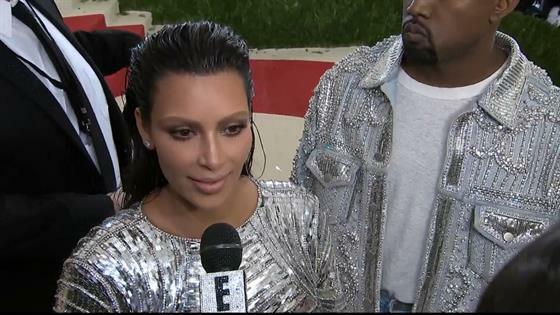 Kim Kardashian and Kanye West have arrived! The couple walked the red carpet Monday at the 2016 Met Gala, both wearing Balmain. North West was a big fan of her mom's look. "Leaving the house, my daughter was like, 'Mommy, I need that dress!'" Kim told E! News exclusively. "I was like, 'As soon as I'm home, you can have it...I just need it tonight, then it's [yours]. You can wear it prom!" As Kim confirmed to a fan on Twitter, her ensemble was very much "On theme: with "Manus x Machina: Fashion in an Age of Technology" theme for the night. The Keeping Up With the Kardashians star was happy to have a date night with her husband, even though she'd been up late the evening before! "Ok its 2am just finished my spray tan," Kim tweeted previously. "I'm so exhausted." Clearly the end result was worth it!